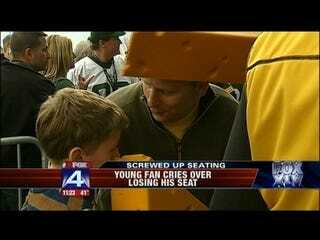 This young cheesehead cried (video here, H/T reader Patrick) when he, along with 399 others, could not get into last night's Super Bowl. He cries for the others, young and old, left out in the Arlington cold. They will leave Super Bowl XLV with $2,400, tickets to next year's Super Bowl, and nothing. It's about the concessions! Here are the faces of Roger Goodell's America. This kid did not cry. Good job, kid. Nor did you, half-Steeler, half-Cowboy. Nor did you.